These were the most moist, juiciest, flavorful pork chops I've ever made. And they're title was "IDIOT PORK CHOPS" so you know they're easy! I stole this image from Taste of Home. I don't know if their recipe is the same, but my chops looked just like this. Mix the melted butter and the eggs being careful that the butter is not so hot it will cook the eggs. Dip your pork chops in the butter/egg mix, and then the Italian bread crumbs, and then dip it AGAIN in the butter/egg mix and Again in the Italian bread crumbs. You have to dip it in each twice as it is not as good if you only do it one time. 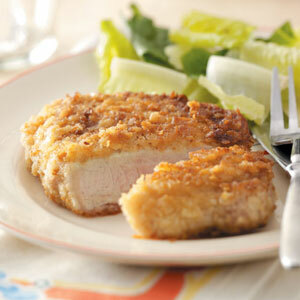 Bake the pork chops at 350 F. for 40 minutes to 1 hour depending on the size of the chops.